The stage is set for the September 29 rally of the Congress to be addressed by Chief Minister Bhupinder Singh Hooda and several other Central and state-level leaders at Kharia village in Sirsa. 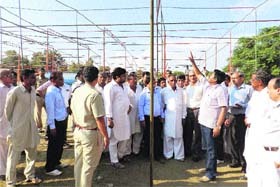 Deputy Commissioner J Ganesan and SSP Saurabh Singh review the preparations of the stage for the Chief Minister's rally at Kharia in Sirsa. The Sushant School of Design at Ansal University, Gurgaon, hosted a two-day Ajrakh designing and printing workshop recently. The workshop was conducted by Dr Ismail Khatri, a master Ajrakh craftsman. Master Ajrakh craftsman Dr Ismail Khatri trains students at Ansal University in Gurgaon during a workshop. The Uttar Haryana Bijli Vitran Nigam and the Dakshin Haryana Bijli Vitran Nigam are all set to provide the facility of online submission of applications for new industrial connections in the state. The facility would be made available to non-domestic and domestic category applicants in a phased manner. Prof Rajbir Singh, Director, Consortium for Educational Communication (CEC), UGC, New Delhi, here recently stressed upon the need for restructuring 'instructional syllabi' and introducing more training courses at various levels in the Public Relations Departments and the Institutes of Mass Communication of the country. The Karnal Municipal Corporation is facing an acute staff crunch as 72 posts are lying vacant, causing inconvenience to people. Despite being the number one state on several parameters, Haryana lags behind several other states of the country when it comes to Infant Mortality Rate (IMR) and Maternal Mortality Rate (MMR). The Regional Research Centre on Foot-and-Mouth Disease (FMD) at Lala Lajpat Rai University of Veterinary and Animal Sciences, Hisar, (LLRUVAS) has bagged the first position among the 23 centres of project directorate on FMD in the country. The Airsoft Infosys visited the Galaxy Global Group of Institutions to conduct a placement drive for the final year students of Master in Computer Application (MCA). A team of business analysts and senior JAVA developer, conducted a pre-placement talk with the candidates. 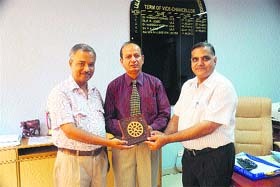 The Indian Institute of Architects (IIA), a national-level body of architects in the country, has appointed Ajay Monga, Associate Professor, Department of Architecture, Deenbandhu Chhotu Ram University of Science and Technology, Murthal (Sonepat), Haryana, as a Member of the Architectural Education Board. Chief Minister Bhupinder Singh Hooda has directed the Public Health Engineering Department to prepare a plan for drainage of sewerage water in villages having a population of over 10,000. The contract system in government jobs will be abolished if the Indian National Lok Dal (INLD) comes to power. This was stated by INLD state president and local MLA Ashok Arora while addressing Thanesar halqa INLD SC party workers' meeting Punjabi Dharamshala recently. The Guru Nanak Institution (GNI), Mullana, held a cleanliness exercise on the Markanda river under a community service camp. Students of the third and the fourth year participated in the camp. There have been no officials in the death and birth registration office of the local municipal council for the past five days. The director of "Ra One", Anubhav Sinha, has come up with a 3D venture shot underwater with few newcomers. First timer Santosh Barmola, Madhurima Tuli, Varun Sharma, Susana Rodriques, Jitin Gulati and Sumit Suri play lead roles and are supported by Manjari Fadnis. Kharia village falls under the Rania Assembly segment of Sirsa and the rally is being organised by Ranjit Singh, a former minister and senior leader of the party, who had contested this seat in the 2009 Assembly elections. Deputy Commissioner J Ganesan and Senior Superintendent of Police Saurabh Singh have been personally supervising the setting up of stage and other arrangements for the rally with administrative and policing angle, though Ranjit Singh himself has been touring to villages to mobilise crowds. The rally has assumed importance for several factors. This will be the first rally to be addressed by Hooda since Leader of Opposition in the state Assembly Om Prakash Chautala and his son Ajay Singh, who enjoy a considerable influence in their home district Sirsa, have been jailed in the JBT Recruitment Scam. This will also be Hooda's first political rally in Sirsa after his own former Cabinet colleague Gopal Kanda was booked in his former staffer Geetika Sharma's suicide case. Although Hooda has addressed a Congress workers' meeting at Sirsa and inaugurated a Centre of Excellence for Fruits near Dabwali during this period, but it will be his first public rally since he addressed a public meeting on March 25, 2012 — also organised by Ranjit Singh. Hooda would lay the foundation stone of development schemes worth Rs 90 crore in the Rania Assembly constituency and would also address a public rally at Kharian village in Sirsa district on September 29. Ranjit Singh said Hooda would lay the foundation stone of Rattakhera Kharif channel costing Rs 71.79 crore at Kharian village. This project would be completed with the cooperation of NABARD. The channel would facilitate irrigation in 15,907 acres of agricultural land of 15 villages. He said that 219.48 acres of land would be acquired for the channel project. There is a proposal to construct 40 new bridges on the channel project which would improve connectivity between the adjoining villages of this channel, he added. The Chief Minister would lay the foundation stone of an industrial training centre costing Rs 7.32 crore at Rania. Hooda would also lay the foundation stone of Astroturf hockey ground costing Rs 5 crore at Jiwan Nagar village. In this way the long-pending demand of the youth of the area would be fulfilled and international-level sports facilities would be provided to hockey players. The Chief Minister would also lay the foundation stone of a sports stadium costing Rs 1.64 crore at Rania village. He said the Chief Minister would lay the foundation stone of a primary health centre costing Rs 3.39 crore at Dhottar village which would provide better health facilities to about 30,000 people residing in the adjoining villages. Prof Mike Knowles, Dean, Sushant School of Design, said the underlying idea behind organising the workshop was to promote the use and knowledge of the craft of Ajrakh dyeing and printing, a traditional textile craft practised by the Khatri community of Kuchh in Gujarat. Traditional Ajrakh printing continues to thrive in craft villages such as Ajrakhpur and Dhamadka in Gujarat. Aimed at bringing transparency and tracking of applications, the decision in this regard was taken by the discoms recently. Devender Singh, Chairman and Managing Director, UHBVN and DHBVN, said the state had about 500 MW surplus power and it was in the larger interest of the state to consume the electricity within the state by creating additional load in the industrial and non-domestic sectors. He said the move would not only facilitate the working of the power utilities but also make it convenient for the masses to get new connections. He said the discoms had already asked the applicants to lodge their complaints online or in the directorate of CMD at Panchkula and Hisar. 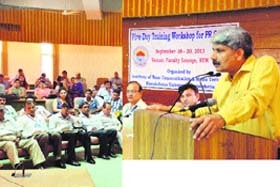 Prof Rajbir Singh, in his presidential address to the delegates of the Haryana Public Relations Departments at the five-day workshop, which concluded in the Senate Hall of Kurukshetra University here recently, also called for a better liaison among the Institutes of Mass Communication and industrial houses in the country. He stated that a better communication between the academicians and the industry would lead to growth in various fields. Prof Rajbir Singh, who enjoys the status of a Vice-Chancellor of a Centre University, desired that research methodology both in industry and communication in the country was much needed. He desired that students of the Mass Communication Departments of the country should be actively involved in such training. The capsule courses should be developed for the benefits of the students for providing them innovative schemes in learning and research. Experienced newsmen from the field should be attached and invited to mass communication institutions for providing practical and in-depth training to the students of the mass communication institutes. Such association of senior journalists would provide practical training to the students and help them in discharging their responsibilities effectively both in the print and the electronic media, he added. He said the CEC had over 20,000 video CDs in different subjects for the benefit of the students. The CEC was also updating its structure and training programme to reach international standards, he added. IMCMT Director Prof SS Boora said focus should be kept on experimentation of innovative creativity in the teaching work at the institute level. He opined that a rational and open-minded approach was the need of the hour to provide better instructional courses to the students. Dr Kuldeep Singh Saini, Joint Director, Haryana Public Relations Department, called upon the PR men to be pragmatic while working for the government in the field. A proper liaison should be maintained both in the print and the electronic media by PR men. The Haryana Government was mooting to set up studios at each district level so as to provide better photographic coverage for different development activities and provide quick photo facilities to newsmen working at the district level, he added. The five-day workshop coordinator and IMCMT Asst Prof Ashok Kumar said education and training should go together for fruitful results in media coverage. As many as 22 experts from different fields of media interacted with over 20 public relation officers during the workshop, he added. Though the elected councillors have assumed the charge and the new Municipal Commissioner has been appointed, key functional posts of the district town planner, assistant town planner and architect, naib tehsildar, kanoongo, patwari, draftsman, assistant and junior engineer (electrical), senior accounts officer, accountant, accounts clerk, medical officer, assistant sanitary inspectors, veterinary surgeon, office manager and assistant managers (IT), land and licence assistants and tax inspectors are lying vacant. Against the sanctioned strength of 350, only 307 safai karamcharis are working. On the contrary, four chowkidars and nine firemen have been deployed against three sanctioned posts of chowkidars and firemen each. The paucity of staff has put the corporation officials in a bind as encroachers and violators of building laws are having a field day. Major civic amenities have crippled due the staff shortage. Moreover, people are running from pillar to post even to obtain birth and death certificates. Workload and staff crunch has become an easy excuse for the MC officials for delay in the delivery of services. The councillors and people have been rendered helpless. Sunil Kumar, who came to the MC office for obtaining other backward classes (OBC) certificate, said it was almost a week that he had been coming to the office, but there was nobody to attend to him. Karnal Mayor Renu Bala Gupta said "The shortage of the staff is a big problem as the corporation is primarily a people-oriented public service institution and people have higher expectations from us as compared to other offices where direct contact is less." The Municipal Commissioner was aware of the staff crunch and we would write a letter to the authorities to fill the vacant posts, she added. Fortytwo out of every 1,000 children born in Haryana die within a year of their birth while 162 out of one lakh mothers die during live birth. Under a special exercise, Regular Appraisal of Programme Implementation in District (RAPID) started by the National Rural Health Mission (NRHM), a 70-member team of experts today completed its supervision of various government hospitals and health centres in Fatehabad today. "While our teams checked various aspects of quality of services being provided in government hospitals, our main focus is on cases of MMR and IMR and to suggest means to minimise these deaths," said Rakesh Gupta, Mission Director of the NRHM while addressing mediapersons after heading a meeting of doctors. Deputy Commissioner Saket Kumar, Civil Surgeon Suraj Bhan Kamboj and Medical Superintendent of the General Hospital, Fatehabad, Mukta Kumar, were among those present. 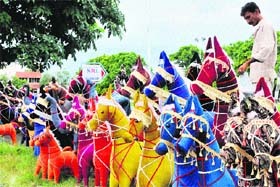 "Fatehabad is the 15th district of Haryana covered under the exercise and one of the better districts," said Gupta, adding that Panchkula, Gurgaon, Faridabad, Kaithal, Kurukshetra and Rohtak were among the best districts in performance while Mewat, Palwal and Panipat were among some of the worst districts in this regard. He said during their week-long exercise, the teams from the NRHM checked a district hospital, a subdivisional hospital, four community health centres, 14 primary health centres, 49 sub centres and three urban Reproductive and Child Health care centres in Fatehabad. "We have found several gaps in various government hospitals in Fatehabad and there is a huge scope of improvement in health services in the district," Gupta admitted. He said it was a "Supportive Supervision" where the emphasis was more on providing support and guidance rather than finding faults. In fact, some doctors and paramedical staff were given appreciation letters by the MD, NRHM for their good work. Among those who received appreciation letters were Dr Mukta Kumar, Medical Superintendent of the General Hospital, Fatehabad, Dr Dolly Gambhir, Dr Renu Bala, Dr Satish Garg, Dr Kusum Gupta, Dr HS Saggu and Dr Aradhna. Gupta said in the teams conducting Supportive Supervision, there were experts from the NRHM, PGIMS, Rohtak and the PGI, Chandigarh. Gupta claimed that the programme was one of the best in the country and it had technical support from international bodies like the United States Agency for International Development (USAID) programmes. Vice-Chancellor said this was the fourth consecutive time that scientists of the varsity bagged the honour for the university. He congratulated Dr Ravindra Sharma and Dr Naresh Kakker, both senior scientists of the department of veterinary microbiology. The Indian Council of Agriculture Research (ICAR) gave the award at the annual Scientist's Meet of Project Directorate on FMD (ICAR) in Pudducherry on Sunday. FMD is a contagious viral disease affecting livestock, causing losses to the tune of 2,000 crore annually. Haryana has been running the FMD Control Programme with the help of the Centre since 2004. Under this programme, all the susceptible animals are vaccinated twice a year. The pre and post vaccination serum (blood) samples of the animals are being tested by the scientists of the regional centre, Hisar, to determine the immunity before and after the vaccination. The regional centre has demonstrated its excellence by meeting all the targets in time. The VC further said the ICAR had sanctioned a new project for the university. The project is "Assessment of Socio-economic Impact of FMD Control in Haryana”. Dr Ravindra Sharma is the principal Investigator for the project while Dr Naresh Kakker is the co-principal investigator. During the first year of the project, three districts Hisar, Kurukshetra and Mahendergarh have been chosen for studying the impact of FMD control. Eight students were selected after clearing the aptitude test and group discussion round for the final HR and technical round, which would be held in the company’s head office in Mohali, Punjab. The students were shortlisted for the post of business development executive, business analyst, software developer and web designer. The students were offered a package of Rs two lakh to Rs 2.50 lakh per annum. Dr SL Gupta, Director General, GGGI, Dr Raj Kumar, Director, GGGI, congratulated the shortlisted students and wished them luck for the final interview. Monga is the only faculty member from the architectural institutions of Haryana, Himachal Pradesh, Punjab, Jammu and Kashmir and Chandigarh who has been appointed as a member of the Architectural Education Board. The IIA has its headquarter in Mumbai. The IIA had also awarded a Certificate of Appreciation for outstanding contribution during 2012 to Ajai Monga at a national-level convention held at Raipur in Chhattisgarh in November 2012. Monga is already a member of several professional bodies. He is keenly interested in research work and has guided several students at undergraduate and post-graduate levels. His interests in research include “Affordable Housing”, “Interior Designing” and “Town Planning”. Monga has been serving Deenbandhu Chhotu Ram University of Science and Technology, Murthal, Sonepat (formerly CR State College of Engineering, Murthal, Sonepat) since 1996 and is consistently working for the cause of the architecture Community. The Chief Minister was presiding over a meeting to review the progress of announcements and major projects for Sirsa district here recently. Hooda directed the officials to utilise the allocated funds only for the projects for which these had been allotted. He also directed them to accelerate the pace of work so as to timely complete all ongoing projects of water supply and sewerage in Sirsa and Fatehabad. He also reviewed the water supply and sewerage works being carried out in Sirsa, Rania, Dabwali, Ellenabad and Kalanwali. The Principal Secretary, Public Health Engineering Department, Sarban Singh, apprised the Chief Minister that out of the total 28 projects for Sirsa district, 25 had already been completed and three were in progress. Arora alleged that the Congress government was exploiting the poor by encouraging the contract system for the past eight years. He said not even a single person had been recruited against class IV government posts (regular) during this period. They were accompanied by the institute lecturers Rajan Jain, Eshan, Shilpa Narula and Paramjit Kaur. The director of "Ra One", Anubhav Sinha, has come up with a 3D venture shot underwater with few newcomers. First timer Santosh Barmola, Madhurima Tuli, Varun Sharma, Susana Rodriques, Jitin Gulati and Sumit Suri play lead roles and are supported by Manjari Fadnis. Anubhav Sinha has pinned high hopes on this film, which opens today all over Haryana.